Burma and parts of India have suffered intense monsoon rains causing severe widespread flooding affecting thousands of people. Many people have lost their homes, fields and devastatingly also their loved ones. Current death toll estimates are likely to be a significant underestimate, causing this to be a distressing time for many. People have been forced to leave their homes, hungry, homeless and in need of shelter, food and clean drinking water. In addition landslides have blocked roads and transport routes have been destroyed making access to food and materials challenging. Farms and fields and been destroyed resulting in a steep rise in the price of rice and vegetables and in some areas the price of rice has tripled. Roads and bridges are unlikely to be repaired rapidly and many predict that the price of rice, vegetables, fuel and other essentials will remain high making it increasingly difficult for the poor to afford to eat. Kalaymyo, where the majority of Stand by Me’s work in Burma is based, is in the Sagaing Division, one of the worst affected areas. Although much of Stand by Me’s work is located in close proximity to the floods, we are very thankful that all our children are safe. Over 100 people are now taking refuge in the school and the classrooms which are usually full of students are now transformed into a safe haven for the homeless. The school provided the victims with clothes, soap and toothbrushes and meals. Our staff are now ready to distribute food aid to those with the greatest need. Stand by Me have mobilised two teams to help the victims of the floods with the provision of food and clean water. For the Stand by Me Agape Yankin Children’s Home in Yangon, the waters have flooded the homes and our staff and children have had to evacuate with their essentials to nearby rented accommodation to stay safe from the rising waters and wait for the floods to abate. We expect it may take over a year for some areas to recover from this severe flood and Stand by Me want to support our children and the local people while they work toward this goal. Thank you for your support of the children in our care in Burma. Please keep our children, the people of Burma and our staff in your prayers. Thanks to your encouragement and support, Stand by Me’s team in Burma have reached 25 villages and over 6,000 people with essential supplies. Our team brought aid to the wider areas of Chin State where 40 villages were destroyed by landslides as a result of the floods. The people of these villages are now displaced and sheltering in temporary refugee camps. Their greatest need is for food. The countries main source of food – rice, is now in desperately short supply and the price has risen significantly. We have distributed over 300 bags of rice, 800 zinc rooves, wood for rebuilding houses, building supplies, clothes, blankets, school supplies, oil, beans, soap, toothbrushes and water pumps. 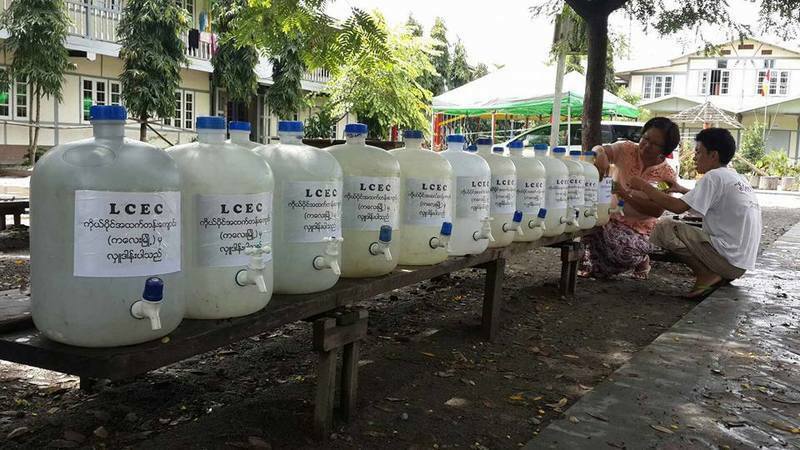 We have provided financial help to pay hospital fees for those that were injured or sick and provided 100 pipes to restore access to a water supply to Dol Luang Village in Tedim. Thank you for generosity to bring relief to the victims of the Burma floods. 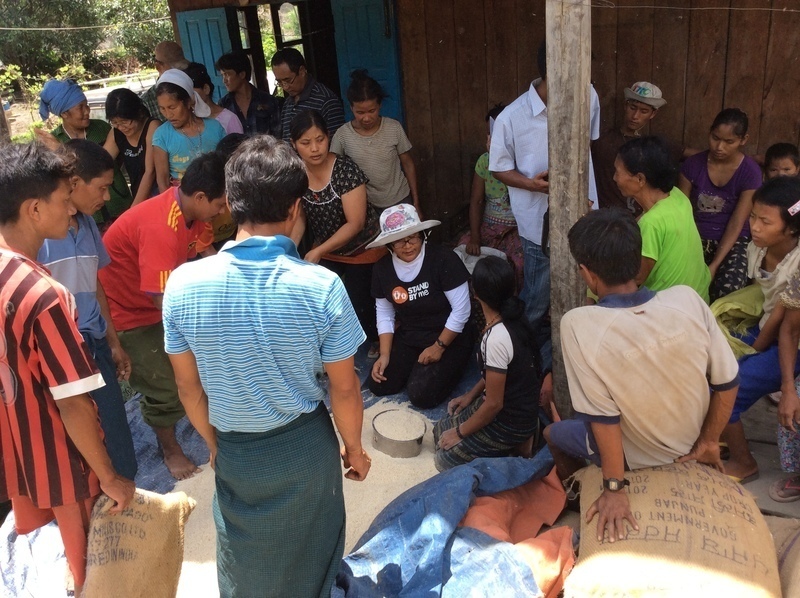 Stand by Me’s team in country have worked extremely hard to respond to local needs in Northern Burma, organising the transportation and distribution of rice and food supplies along with clean drinking water to the villages with the most need. Weather conditions and damaged transport routes has meant that journeys have been difficult, but our team has persevered and in the last month they have reached several villages in Northern Chin State and Sagaing division. Many people in these areas have been forced to evacuate their houses to escape the floodwaters and are currently residing in temporary shelter. Even where floodwaters have subsided, houses, fields and possessions have been left covered in a thick layer of mud and clean drinking water is in short supply. Our team visited the village of Sithar in Sagaing division, where the majority of families were living in temporary shelter. With no means to purify water, their health was at risk. Our team delivered clean drinking water to each family, giving them hope to survive and gave sweets to the children, adding excitement and smiles to difficult living conditions in temporary shelter. A great number of people living in Burma are completely dependent on rice farming for their livelihood. The floods destroyed their harvest and has left them in great hardship. Prices of food throughout the country have skyrocketed, pricing ordinary folk out of purchasing food. We delivered almost 200 sacks of rice to the villages of Laibung, Thangnuai and Sozang in Tedim in Chin State, this rice will feed them for 3 months. Our team visited the village of Naak Zang, approximately 97 miles from Kalaymyo where our team are based. It is home to just 71 families and its location on the riverside caused the floods to sweep away their crops. We distributed 47 bags of rice to all the families in Naak Zang and met one of the village elders who commented “some help come last week for only our own church members, but you have brought rice and red beans for every person in the village. You have shown us God's love! I am so proud of being a Christian!" Thank you for making it possible for us to reach people that otherwise would be forgotten. Without you we would not be able to provide needy families in Burma with essential relief and reassurance that they are not alone. 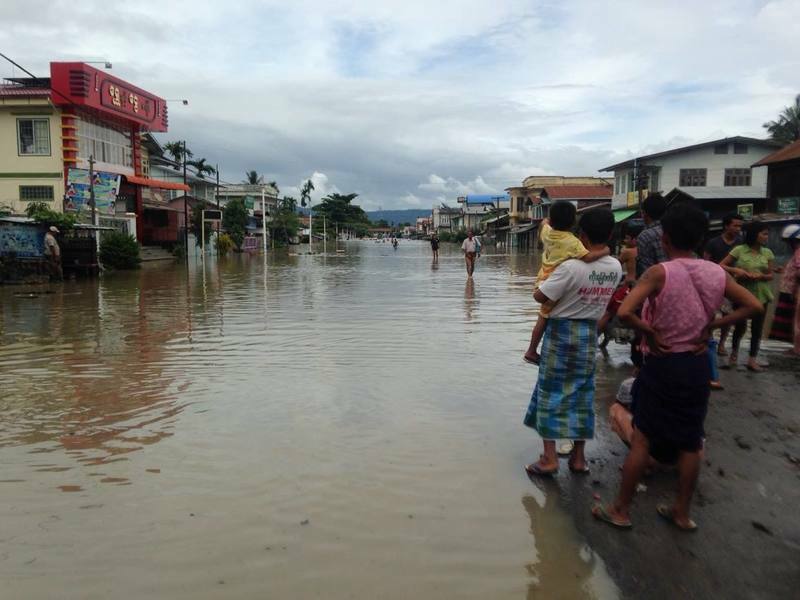 Our team has been working tirelessly to provide aid to the victims of the Burma Floods. For people whose homes have been devastated by the floods and are living in temporary shelter, the provision of water, food and clothes is essential. Although our team has faced difficulty travelling through floodwaters and mud filled paddy fields they have reached the people who are in need, reassuring them that they are not alone and providing them with the basic necessities to survive. There is still many people who need our help and our team will continue to work relentlessly to meet their needs. Thank you for all your support enabling us to care for the distressed in Burma. Urgent aid has been delivered to four more desperate villages in the Irrawaddy Delta as heavy rains continue to fall across Burma, plunging the flooded villages and towns deeper into despair. Many are still trapped in their villages as flood waters are so high that there is no means of escape to seek food or clean water, with some villages sharing just a single canoe or boat. This week David, our Director in Burma, led another team of staff and volunteers to deliver aid to the four villages where houses are still standing but all of their possessions have been destroyed or washed away. With the damage caused by the floods increasing day by day, panic is beginning to set in. Our team collected bags of rice and along with water, medication including diarrhea and rehydration salts, noodles, biscuits and clothes, they drove by truck for 40 minutes until they had to transfer across to boats. They hired three boats and travelled for some hours in the heavy rain to reach the villages, where the aid was then transferred to canoes and transported to 320 families in need. The team was very pleased to be able to show God’s love to those of Christian, Buddhist and Catholic beliefs in a practical way and once they had distributed the aid, they returned home in the heavy rains. A growing concern is the number of rice fields buried under water (above), which will leave entire villages without any rice to harvest. This has forced the food prices to escalate rapidly and there is fear not only of the immediate lack of food but also for the damage to crops over the next 12 months. One volunteer described the rice fields as unrecognisable, as if they were looking at ‘the ocean’. The water in the fields is measuring up to 12 feet high in some places and after the floods subside in the coming months, there is a worry of how much mud will be left behind. The villagers will not be able to travel across such vast amounts of mud by foot or vehicle until it has dried out, which may take months, and there is fear what will happen to food prices and availability in the mean time. Our team of staff in Burma will continue to provide aid and assistance where they can – thank you for helping those affected in Burma. Flood waters in Burma are beginning to subside in places, revealing the extent of the water damage to people’s homes and possessions. However, many villages are still suffering from the floods. In our Lois School there are still over 100 people sheltering including some of the families of our students and teachers. One man (above) sheltering at our school told us of his feelings about the floods “I came directly here with my family of six members. To be in this situation is beyond our expectation as we never heard this kind of disaster in our town before. My wife cried a lot for our losses as we discussed of our grandchildren’s future, but now things get better for us. We really feel indebted to the school for taking care of us as their own blood and flesh. They provided us clothes and food besides this comfortable building to shelter.” Stand by Me will continue to help the victims of the floods with the provision of food and a safe place to stay. Thank you for your prayers and support for those affected by this disaster.